Home Learning Center Off Grid Off-grid Solar System Components: what do you need? Off-grid Solar System Components: what do you need? For a typical off-grid solar system you need solar panels, charge controller, batteries and an inverter. This article explains solar system components in detail. For this system to function well, you need a connection to the grid. Instead of a grid-tied solar inverter, you can use a standard power inverter or off-grid solar inverter to power your AC appliances. For this system to work, you need a load connected to the batteries. 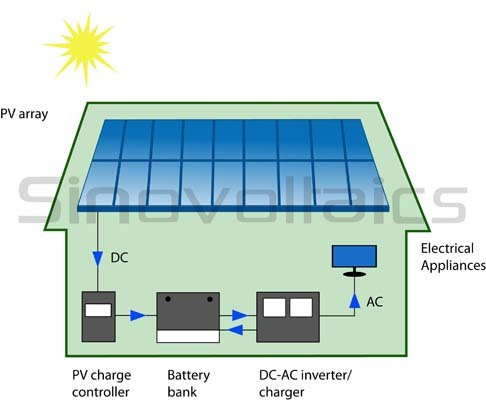 PV Panel: This is used to convert solar energy to electrical energy. Whenever sunlight falls upon these panels, these generate electricity which feeds the batteries. Charge Controller: A charge controller determines how much current should be injected into the batteries for its most optimum performance. As it determines the efficiency of the entire solar system as well as the operating life of the batteries, it is a critical component. The charge controller protects the battery bank from overcharging. Battery Bank: There may be periods when there is no sunlight. Evenings, nights and cloudy days are examples of such situations beyond our control. In order to provide electricity during these periods, excess energy, during day, is stored in these battery banks and is used to power loads whenever required. DC-AC Inverter: A DC-AC solar inverter (or just a ‘solar inverter’) is a power electronics device which is used to convert Direct Current to Alternating Current. The electricity generated by Solar Systems is DC in nature while most of our household loads require AC power. This conversion takes place in real time with a very minimal time gap (nowadays inverter efficiency goes up to 98%). DC loads can be directly fed from the solar system and do not require an Inverter. Connected Load: Load ensures that the electrical circuit is complete, and the electricity can flow through. Backup Generator: Even though a backup generator is not always required, it is a good device to add as it increases reliability as well as redundancy. By installing it, you are making sure that you are not solely dependent upon solar for your power requirements. Modern generators can be configured to start automatically when the solar array and /or battery bank doesn’t provide sufficient power. Transfer Switch: Whenever a backup generator is installed, a transfer switch must be installed. A transfer switch helps you to switch between two sources of power. For example if the solar system is backed up by a diesel generator, a transfer switch helps you to choose the source of electricity. Transfer switches can be automatic or manual. AC Load Center: An AC Load Centre is somewhat like a panel board with all appropriate switches, fuses and circuit breakers that help maintain required AC voltage and current to corresponding loads. DC Load Center: A DC Load Centre is similar and also includes all appropriate switches, fuses and circuit breakers that help maintain required DC voltage and current to corresponding loads. We are not on the grid. We would be totally dependent on the system.